Newcastle metro shopping center is one of Europe's largest indoor shopping centers. It boasts of over 350 shops and restaurants and themed shopping enclaves. The bowling alley, food court and multi-screen cinema make it a popular shopping and leisure haunt. Metro center shopping in Newcastle has a host of small unique shops. This shopping centre is located in Gateshead across the river Tyne and is home to big names in retail. You can find designer boutiques, fashionable shops and greengrocers and bakers too. 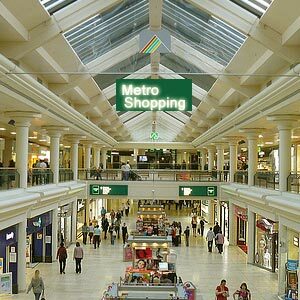 Newcastle metro shopping centre remains the Mecca of shopping in the Tyneside region. Newcastle offers many shopping opportunities. The shopping centers of Newcastle are famous. Eldon Square in the heart of Newcastle city is a huge mall. The plan for a ?170m refurbishment has been recently shelved. There are nearly 145 shopping options in this shopping centre in Newcastle and restaurants and cafes too. Market Street and Grainger Street have some specialty stores. Greenmarket and the weekend markets at Tynemouth station are the shopping areas in Newcastle where you can pick bargains.